Johnson Avenue might be the biggest determining factor in how the formerly industrial area between Williamsburg and Bushwick proper changes in the coming years. 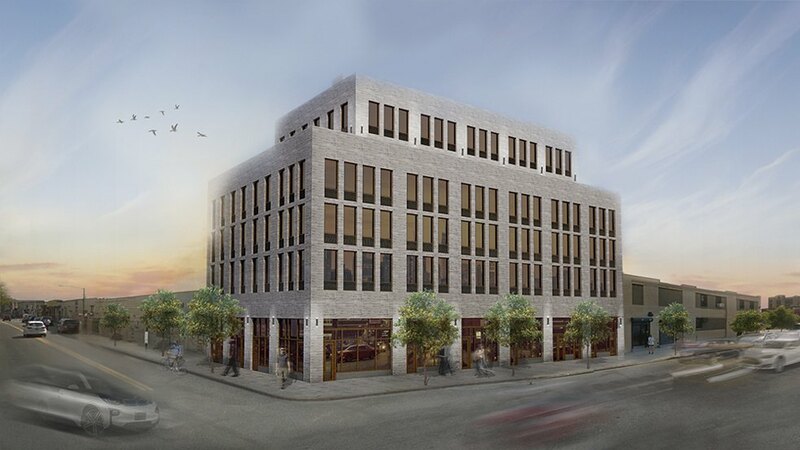 Already, two developments on the corners of Johnson and Bogart and many rumors about hotel developments have been the subject of much speculation and debate. Details about one of these developments are available now: check out the neighborhood's newest multi-use co-working space. The co-working space is described by spokesperson Diana Morgan as a project wherein the focus will remain on the local. The building's first floor will be filled with local vendors, and the art (both permanent and temporary) will come from the community itself. Moves have already been made in this direction: the space is offering mural space on Ingraham to The Bushwick Collective for a project. Morgan hopes this kind of neighborhood involvement will "set a precedent for other developers in the area." One of the most interesting ideas associated with the still-unfinished space is a pop-up gallery which would be offered to artists on a rent-free basis. The application process has yet to be fully established, but the intent is provide opportunity to artists who might otherwise lack access to exhibition space. The 6 story building will feature a 5th floor terrace, and a 6th floor event space with access to a rooftop designed by Eray Carbajo, a Brooklyn and Istanbul-based firm. The co-working spaces are still being designed, but established elements of the design include custom furniture, underground parking, and Ichiran Ramen next door. Pricing structure for the space is not yet available. The building itself is scheduled to open officially in November of 2016, but co-working spaces will be available to tenants starting in September. Thus far, the foundation has been poured and work has commenced on the first floor. Full disclosure: Several freelance Bushwick Daily contributors have worked professionally with RealWorks on promotional material for this project, but Bushwick Daily publishes this piece without RealWorks oversight.